The South Portland eatery’s wine list and food attract an enthusiastic following. Laura and Bob Butler thought they were done with the restaurant business when they sold their popular Portland-area eatery, Rachel’s L’Osteria, in October 2009. They closed shop and moved to Florida. Two years passed before they started to miss Maine (and the restaurant business). Now a year after opening Enio’s, a 30-seat Italian bistro in South Portland named for Laura’s father, the Butlers have captivated new customers and even lured back their old following. AMENITIES: High-back barstools, extra bar-style seating along window, clean and cute bathroom, coat hooks, dim but pleasant lighting, retro tile floors. PARKING: Small parking lot in the back and more parking on side streets. 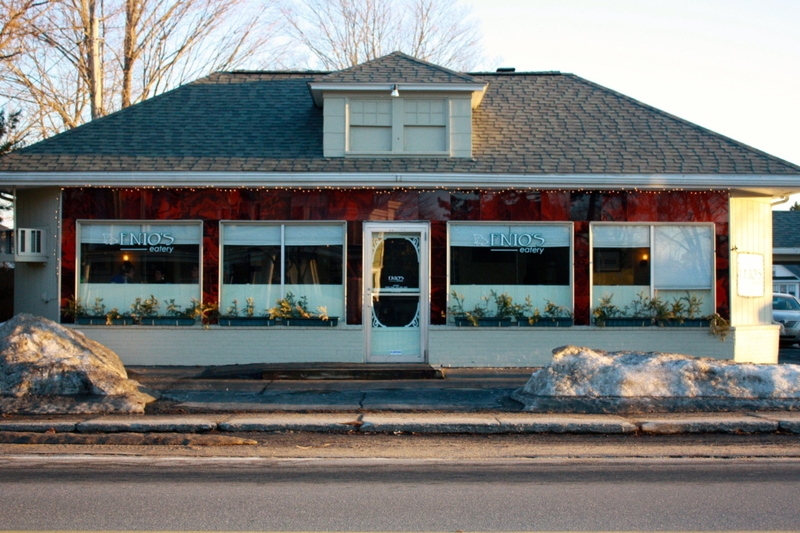 BOTTOM LINE: Enio’s Eatery in South Portland is the relatively new restaurant of Laura and Bob Butler. Laura is the sole cook and Bob manages the dining room, in addition to selecting the impressive wine list. If you’re not sure where to try next, put Enio’s at the top of your list. Enio’s on Cottage Road has quickly become a neighborhood staple. Where Rachel’s had tablecloths and a more formal dining service, Enio’s is more of an authentic wine bar, with a wall behind the bar of Bob’s handpicked wines, six seats at the bar and about 15 more along another bar that faces the window. Two and four-top tables are tucked in at both ends and sleek, retro tiles give the place a European feel. A stellar selection of about 50 wines is available – most are Italian (Bob’s preference) and more than half are reds. Every night Bob will feature one white and one red on the menu for $6-7 a glass. For beer drinkers, there’s also a good list, though much shorter than the wine list. Local craft beers like Bunker, Maine Beer Co. and Banded Horn are all on tap. All drafts are offered as pints or as a “shorty,” which is about nine ounces at almost half the price. The Butlers wanted to allow people to come in earlier for a glass of wine or a meal, so doors open at 4 p.m. Wednesday through Saturday. Enio’s has attracted quite a following in the neighborhood – many have made the restaurant their go-to place for a good glass of wine and outstanding Italian food.